This article was originally published by Campus Progress and is re-posted here with permission. A troll is somebody who deliberately goads others on “Internet message boards” (you might remember these from GeoCities) just to get a reaction. And you, Joel Stein, are the perfect example of an offline troll: a journalist who riles up readers by smearing an entire generation as lazy—only to turn around and completely undermine his own half-baked shock-bait with the latter half of his article. I’m loath to feed a troll, but this particular troll, who admitted to “cozying up to the editor of the magazine” in his early career, has too wide and too credulous an audience. Some of Stein’s mistakes may be simple carelessness. Maybe, when he wrote that Millennials “have less civic engagement and voter participation than any previous group,” he just hadn’t read that Millennials are most interested in civil service careers and volunteerism, had record levels of voter participation last year and care far more about family than fame. Maybe it didn’t occur to him, when citing a survey of middle schoolers who want to grow up assisting famous people, that early adolescence isn’t the best time to evaluate most people’s career paths. And maybe he just hadn’t heard that the National Institutes of Health survey about Millennials’ narcissism has been called into serious question under peer review. But too many of Stein’s blunders are internal contradictions that if not he, then his editors, should have known better than to print. Maybe that “perceived” entitlement is just “how rich kids have always behaved,” but Stein’s most glaring omission is failing to acknowledge just how not-rich this generation is becoming, and just how badly the baby-boomer-created system has failed them. It’s hard to fathom how Stein can call Millennials lazy when too many of them slave for sixty-hour weeks working multiple jobs to take unpaid internships, all so that they can see no wage gains from all that extra work. 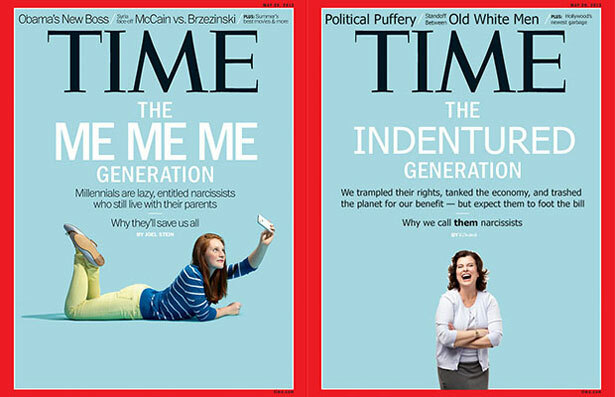 It’s outrageous to connect Millennials’ supposedly “stunted” intellectual growth with the popularity of keeping them on their parents’ insurance until age 26, when the reality is that “good jobs” with benefits are getting harder to find. And it’s jaw-droppingly insulting that Stein’s only discussion of low-income youth is a flippant reference to “ghetto-fabulous” lifestyles. The “how Millennials will save the world” part of the piece has some decent points. Millennials have positive attitudes. They are shaped by, and shape, the technology and environment they are presented with. Their egalitarian, decentralized understanding of the world will change and benefit both them and the world. But Millennials and their world won’t benefit from confused, stereotype-driven understandings of who they are and what they care about. While we keep building bridges to the future, let’s keep the trolls tucked away underneath them. Emily CrockettEmily Crockett is a reporter with Campus Progress. Follow her on Twitter @emilycrockett.